US, 2002, 98 minutes, Colour. Edward Byrnes, Elijah Wood, Rosario Dawson, Malachi Mc Court, Oliver Platt, James Handy. The prologue of this film takes place on Ash Wednesday evening, 1980, in Hell's Kitchen, New York. A young man overhears thugs planning to kill his brother. Instead, to save his brother, he kills them and has to flee the city, his brother and friends making out that he is dead and his body washed up from the river. 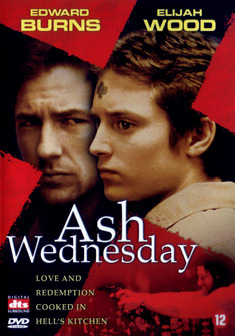 The main action takes place on Ash Wednesday, 1983, when the brother returns home and is sighted. His brother and his local boss want to keep it quiet. Feuding family members want vengeance. His wife does not know that he is alive and has been in a relationship with his brother. It's a very busy day. Nevertheless, most of the characters seem to be able to get to Mass. The ashes are displayed on their foreheads quite conspicuously. They are all part of the Irish Mafia of this part of New York City, with codes, loyalties and vengeance as strong as in the Italian Mafia not all that many blocks away. The film was written and directed by its star, Ed Burns, who made an impact with his feature debut, The Brothers Mc Mullen. He has stayed with the New York he knows best in his subsequent films, She's the One, No Looking Back and Sidewalks of New York. Perhaps the trouble is that he knows them so well and re-creates them in such detail that his absorption in his city and his characters does not excite wide audiences so much, unless they are in the know or have a personal investment in the place or, as here, in the spirituality behind the celebration of Ash Wednesday. Burns relies on audiences recognising the ashes (and has a Church sequence) and knowing that we are dealing with sin, repentance and salvation and that this underlies the behaviour and decisions of the central characters, one of whom is the local priest (James Handy). Elijah Wood plays the younger brother and Rosario Dawson his wife. Writer Malachy Mc Court plays the Irish boss. An insider's view of New York. 1. Edward Byrnes’ films? Their particular locations? Point of view? New York stories, the sidewalks of New York? 2. Hell’s Kitchen, the locations, the atmosphere, the 1980s, homes, bars, church, streets? The musical score? 3. The title, the beginning of Lent, penance for sin, the distribution of the ashes in the church, Catholics with the ashes on their forehead? Penance, the focus on the person of Jesus, forgiveness? A sign of hope? The visualising of ashes and prayer? 4. The prologue, the visuals, Francis Sullivan, the bar? The discussions, hearing the sounds, the arguments, the shooting, the consequences? 5. The transition to 1983? The focus on one day? Francis Sullivan’s day? The memories of his father? Whitey and the information? The accusations, the rumours, denials, Grace and her situation, the death of her husband, at least her believing this? Her relationship with Francis? 6. The uncle and being on the take? Sean, his disappearance, his decision to return? Whitey and his dominance? Moran and his role? 7. Brooklyn, the shooting, getting Sean away, the bar and the shooter, the massacre? The morning after? 8. The character of Whitey, his dominant presence, the Irish background, in the bar, his role with the Irish Mafia? His way of doing things? Holding court, orders, deals? 9. Moran, the henchman, the plans, being defeated, the exception, bringing in the shooter? 10. Grace, her life, her relationship with Sean, being a widow for three years, the relationship with Francis, her experience? The contrast with the former girlfriend? 11. The two brothers, the credibility of Elijah Wood as Sean? His behaviour in 1980, his being caught, trapped, the escape, the cover-up? His decision to come back, the effect on everybody’s life? The further dangers? The shootings – and the resolution on Ash Wednesday? 12. The religious dimensions, the specifically Irish Catholic dimensions, iconography? Giving a tone and some theological meaning to the events?